Walking L Thoroughbreds LLC’s Cairo Cat is the early points leader on the 2019 “Road to the Kentucky Derby Presented by Woodford Reserve” after he closed strong in deep stretch to upset 6-5 favorite Tight Ten by a half-length in Saturday’s 37th running of the $150,000 Iroquois (Grade III) for 2-year-olds at Churchill Downs. Sent to post at odds of 17-1, Cairo Cat covered 1 1/16 miles over a fast track in 1:45.35 to bank $86,490 and 10 points on the “Road to the Kentucky Derby” point system that will determine the field for next year’s 145th running of the Kentucky Derby Presented by Woodford Reserve (GI) on May 4, 2019 at Churchill Downs. The Iroquois was the first in a series of 35 select races on the “Road to the Kentucky Derby,” which is now entering its seventh year. The Iroquois also is part of the Breeders’ Cup “Win and You’re In Juvenile Division” Challenge and the win by Cairo Cat earned the Kentucky-bred son of Cairo Prince a guaranteed spot in the starting gate for the $2 million Sentient Jet Breeders’ Cup Juvenile at Churchill Downs on “Future Stars Friday,” Nov. 2. 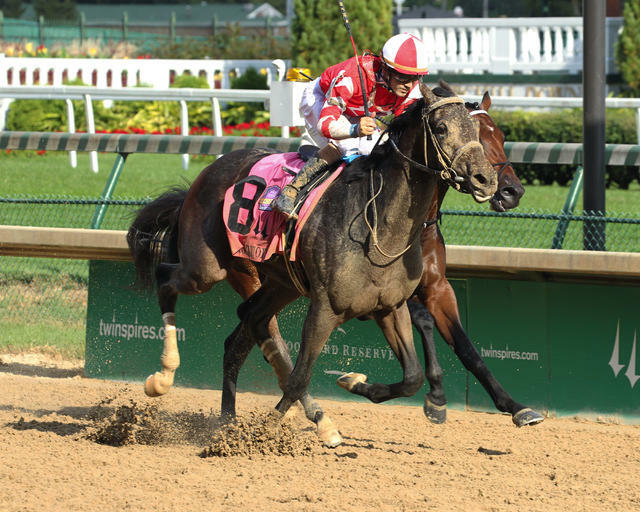 Cairo Cat’s $60,000 entry fees will be paid by Breeders’ Cup Ltd. and his connections will receive a travel stipend. Tight Ten, who was made the favorite after finishing second to Call Paul in the Saratoga Special (GII), led most of the way through fractions of :24.03, :48.74 and 1:14.06. Cairo Cat raced near the rear early on and moved into contention from the inside down the backstretch. Patiently handled by jockey Brian Hernandez Jr., Cairo Cat waiting for an opening at the top of the stretch, found room and then switched to outside of Tight Ten inside the final furlong to edge clear in the final stages. Cairo Cat paid $36.20, $13 and $8.80 to give trainer Kenny McPeek his second win in the race. He won the Iroquois 17 years with Harlan’s Holiday in 2001. Tight Ten, ridden by Ricardo Santana Jr., returned $3.20 and $2.60. Pole Setter was another 1 ¾ lengths back in third under Florent Geroux and paid $5.20, and Tobacco Road was fourth with Julien Leparoux up. Everfast, Synthesis, Manny Wah, Royal Urn, My Sixth Sense, Hog Creek Hustle, Mr Wrench It and Drunk as a Skunk completed the order of finish. Cairo Cat was bred in Kentucky by Clifton Farm LLC. The Cairo Prince colt is out of the Tale of the Cat mare La Belle Cat.